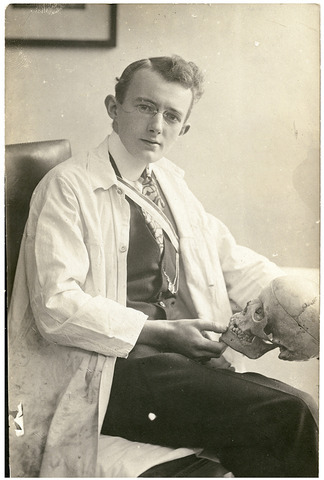 The work ´Love at First Sight´ (2007) consists of a 2-page love letter addressed to a young English woman and a postcard-size B+W picture portraying its writer: a young gentleman-doctor holding a skull on his lap. Apparently dating 1934, the fictional love proposal is composed in response to a found photograph, appropriating the story ´Die Liebe auf den ersten Blick´ by Frank Wedekind (1864-1918). Taken together, image and text are working through 19thC beliefs in physiognomy, face value, class, gender and portraiture as relevant to both photography and the archive. 'Love at First Sight' in: Rattle Journal – Journal for the Convergence of Art and Writing, issue 2, London, 2011, pp.1-4; ISSN 2047-3885.